Ionas spent his early career working internationally as a food, wine and travel photographer. His images of the world’s famous landscapes and food producing regions, wine production and diverse people appeared in many formats and publications. The advent of digitalisation in photography prompted Ionas to turn more seriously to his lifelong interest and practise of metal sculpture. 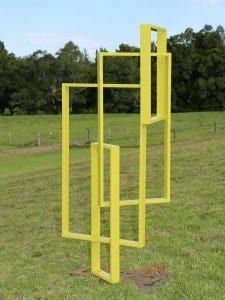 His early experimentations in form and function received encouragement when he successfully exhibited at Sculpture By The Sea Bondi (2007) and Sculpture By The Sea, Cottesloe (2008). To further his skills and knowledge of metal fabrication in 2013 Ionas completed a Cert III in Engineering – Fabrication Trade. In acknowledgement of his advanced abilities in this field, he was the course’s recipient of “Most Outstanding Metals Student” of 2011. Since completing his trade, Ionas has been working full-time as a metal fabricator at a leading metal engineering fabrication company in Queanbeyan, NSW. He has also been raising two children. Now that Ionas’ youngest child is less dependent, Ionas has been able to claim chunks of time in which to begin developing the sculptural ideas that have been germinating throughout these busy years. 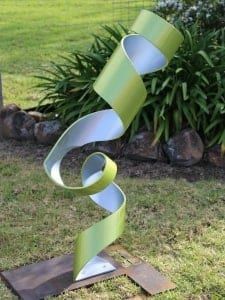 His interest in form, function and the harmony of solid shape within space has been married with a keener interest in colour and recognition of the effects of tone on a final piece. He is now happily sketching ideas, using a 3D printer to develop prototypes and spending weekends in his workshop welding his unique ideas into sculptural reality.